You'll be £10.00 closer to your next £10.00 credit when you purchase Storm Chaser. What's this? The storms that cross the Great Plains of North America each spring are some of nature's most spectacular. They can also be some of the most dangerous. Most people who live in areas susceptible to these storms keep a close eye on the weather reports and take cover or evacuate when one is on the way. Storm chasers keep an even closer eye on the weather data, but for a different reason: they don't run away when they see a storm approaching, they follow it! 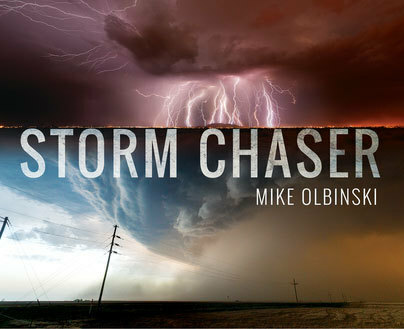 Professional photographer and Emmy Award winner, Mike Olbinski has chased storms throughout his native Arizona, as well as even further afield, including Texas, Oklahoma, Kansas and Colorado. Whether he's photographing lightning, tornadoes or even cloud formations, his remarkable images are able to convey the awesome power and beauty of nature in its most dramatic and impressive forms. With over 100 stunning colour photographs, this book brings together some of Mike's most breath taking images from the past five years as he describes his love of the open road and the thrill of capturing the perfect storm on film. A striking series of breath-taking pictures of nature lashing out from apocalyptic skies. ★★★★★ Awesome on the Kindle, I'm going to have to get the hardcover now! ★★★★★ The illustrations are breath taking! Such a great book by a great author. This is a must have for those interested in both weather and photography! ★★★★★ Great quality book.... Impressive photos... amazing texts and stories with each photo...A must have for all stormchasers, storm lovers, photographers, etc... Love it! Each flawlessly reproduced and truly memorable image is accompanied by a succinct commentary, making "Storm Chaser" an inherently fascinating volume from cover to cover… very highly recommended. A book open to the imagination with some magnificent photographs. Great quality book, Impressive photos, amazing texts and stories with each photo. A must have for all stormchasers, storm lovers, photographers etc... Love it! This volume is unashamedly a ‘Picture book of storms’: Dust storms, Electrical storms, Thunder storms and Tornadoes. Lightning strikes abound, as towering banks of clouds, many in full-colour and of immense dimensions. The book is beautifully illustrated and although concentrating on storms in Arizona (the author’s home state) it also contains examples of storms photographed in the adjacent states of New Mexico, South Dakota, Texas and Colorado. If a reader is seeking beautiful and impressive photographs of cloudscapes, lightning strikes, dust storms and tornado's in a western-American setting, then this book will certainly meet those requirements. This book contains some of the most staggeringly beautiful photographs of mega-storms I have ever seen. Stupendous photography! Storm Chaser is a beautiful full color conversation piece for a coffee table. This book is extra wide and landscape orientation for maximum effect. Landscape photography is not easy as it would seem. Trying to capture the landscape and capture the feeling of awe you get when your standing there is not easy. Olbinski captures the landscape and the weather formations beautifully. Most of the pictures are on the right with descriptions on the left. Each picture is described with details about his adventure to get the picture. In many cases, he also gives information on how he got the images. So, for anyone interested in photography, this is great! Also, my two toddlers are getting interested in weather: talking about it, getting excited about rainy days or sunny days, etc. They were actually very interested to see this and it seemed to work well as a teaching tool describing different cloud formations and storms. Excellent book! In 2011, professional photographer Mike Olbinski witnessed an incredible sandstorm over Phoenix, Arizona and the time-lapse video that resulted from this catapulted him in to the media spotlight. Commissioned by ESPN, The Weather Channel and Al Gore's office for use in climate change videos, this became the turning point for Mike's photography career. A wedding photographer by trade, Mike has since had his storm photography and videos licensed by ESPN Superbowl adverts, National Geographic, Arizona Cardinals, State Farm and Marvel Studios culminating in an Emmy Award in 2017. Mike currently resides in Scottsdale, Arizona with his wife and three children and runs workshops, storm chasing tours and mentoring sessions.